If you live in a cold and wintry climate, you know that a snow blower is an absolute essential for keeping your driveway and sidewalks clear. Keeping snow out of the way ensures that your driveway is safe for both walking and driving. continue reading our Husqvarna snow blower reviews to find out which is the best. There are many brands of snow blowers to choose from, but the Husqvarna snow blower is a brand that offers powerful snow blowers that are very effective for clearing away even the biggest of snow piles. In this article, we’ll get over some different Husqvarna snow blower reviews, criteria that we used to choose them and why we think they’re the best. What Should You Look For When Shopping For A Snow Blower? The first thing you’ll need to consider is the type of snow blower you need. There are two types of snow blowers available – single stage snow blowers and double stage snow blowers. The Husqvarna brand makes double stage snow blowers. This means that the snow is picked up and then a separate propeller shoots it away. Single stage snow blowers are much simpler, as they only have one mechanism that picks up the snow and throws it away all at once. Double stage snow blowers are more powerful and can be used on a variety of different surfaces. You’ll also need to consider the size of the snow blower and how far it can throw the snow. The larger your driveway and yard surfaces are, the bigger a snow blower you will need. It may help to measure your driveway and anywhere else you would like to use the device, just to make sure that it will work with the proportions of your space. It’s important that the snow blower can throw the snow far enough away from your cleared surfaces. The ease of use of the snow blower is also important to consider. Bigger snow blowers are more powerful, but they are also much more difficult to use than smaller, lighter machines. Ideally, you’ll want to find a machine that provides a good balance between these two descriptions. The machine should have an ergonomic design that’s easy to use for long periods of time if necessary. How Should I Use A Snow Blower? Snow blowers can be used to remove snow from virtually any surface. Homeowners who have snowblowers can use them to remove snow from their driveways, sidewalks, and gutters to allow visitors to walk and drive there, even in the winter. Larger commercial snow blowers are also used to remove snow from railways, airplane runways, or roads. The snow blower works by picking up snow from the bottom of the machine and then throwing it away from the user, usually off to the side of the device. The pile of snow can then be easily shoveled or moved again if necessary. What Is The Husqvarna Brand Known For? Husqvarna is known for snow blowers that are very powerful and work well in extreme winter conditions. They are designed to be able to clear large amounts of snow at a time with their double stage system. One of the most effective features that the Husqvarna snow blowers have is an easy start feature, which helps you get the machine started if it won’t start in the cold. You can just plug the snow blower into an outlet to get it started. The snow blowers also have wheels with strong traction, so they work well even in icy areas. The steering system is designed for precise maneuvering, which is ideal if you need to cover lots of ground with your snowblower. These snowblowers are quite large, so they may not be your best bet if you have a smaller driveway and you don’t need to cover as much ground. This 24-inch snow blower is one of Husqvarna’s best selling models. 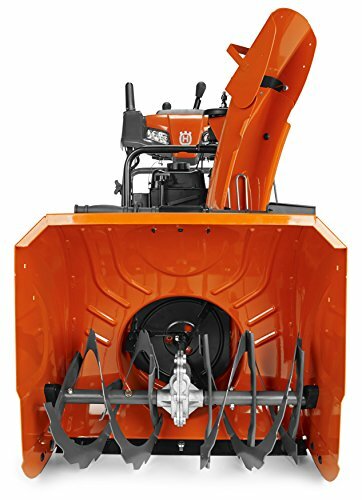 This is one of the smaller models they offer, and it is a good option for those who need a step up from a basic snow blower but aren’t ready for a larger premium model yet. It has 15-inch tires and weighs 198.6 pounds. Because this model is smaller than many of Husqvarna’s other models, it is easier to maneuver and works well for driveways and sidewalks. This model allows you to adjust the speed of the snow blowing as well as the height of the handle to make it more comfortable. It’s important to note that when this model comes shipped, you will need to do some minor assembly. You need to make sure the chute is facing the right way, as it does not come set up manually. Another downside is that it may not be large enough for those who need to clear a huge amount of snow (such as those who live in rural or mountain areas). It is one of the most powerful snow blowers that is made for home use. The small size makes it easier to maneuver than other Husqvarna snow blowers. You will need to do a fair amount of manual assembly, which may be frustrating. The smaller size may be a downside for those who have to clear large amounts of snow on a regular basis. This model is a step up from the 224, but still provides many of the same key features. It is an ideal choice for someone who likes the 224 but needs more power and width to clear larger amounts of snow. The ST230 has a width of 30 inches, 16-inch tires, and a weight of 270 pounds. It can clear snow accumulations of up to a foot, so it’s a very helpful tool to have if you live in climates that get frequent accumulating snow. It has many of the same features as the 224, such as the adjustable handle height and speed. It is more durable than the smaller Husqvarna models, and the more powerful engine enables it to throw snow farther. It’s particularly ideal if you need to clear back roads on a regular basis. This model does occasionally have some issues with the auger belt, but this can be fixed by talking to customer service and assembling the snow blower effectively. The larger size makes it easier to clear large areas more quickly. It’s still relatively maneuverable for the average user, but the wider width is more efficient. Some customers have reported issues with the auger belt needing to be replaced over time. This is one of the most powerful models that Husqvarna makes, and it is best used for mass snow removal. It has an extremely strong hydrostatic transmission engine, which can process snow very quickly and blast it far away from the machine. It also has 27-inch continuous track wheels, which provide better traction than traditional wheels. The 14-inch auger is huge and can process large amounts of snow at once. Although the machine is very large, the control mechanism is straightforward. However, this machine is extremely heavy and not ideal for the casual snow blower user. It is best used by those who have large driveways or open spaces that need to be cleared of snow. The engine is one of the most powerful on the market and moves snow very fast. It has amazing traction, so you can use it on icy or slippery surfaces with no problems. The large size and heavyweight will be too difficult to handle for many people. Husqvarna offers many different snow blower models to choose from. Whether you’re trying to clear a small driveway or a large access road, they have options that will work for you. There isn’t one best model available from Husqvarna – instead, you should choose the option that is most suitable for your needs. I hope you liked our Husqvarna Snow Blower Reviews of the best snow throwers on the market.